I didn't expect to learn much from this book. I'd hoped it would give me some useful ideas for different graphic approaches to current projects. It didn't.I'd thought it might give me a greater knowledge of the history of graphic design so that I would better know what emotions various pastiches evoke.It didn't.This book provides a perfunctory gloss of each of its 100 ideas listing specific projects that specific individuals have made following that idea, but not showing why that idea mattered historically or why I would want to use it now. The language is condescendingly erudite, as though a large vocabulary could compensate for a lack of thought. The authors have demonstrated an outstanding knowledge not only of art, but also social and political events throughout design history. They provide works of the very pioneers as well as the up-to-date artists to illustrate they point. It is aimed rather at graphic design students than the wide publicity and it is very apparent due to the language used: "Taking Dada a step further, punk was so contemptuous of conventional beauty that it proffered a kind of 'haute-ugly'." Not as insightful as I'd hoped but it's a good book to pick up and peruse for ideas when you're feeling stuck. The layout of the text and imagery in this book is cohesive making it easier to read and gain more from it. Informative with a wide variety of ideas from history that influenced graphic design. Overall, an interesting and educational sight into graphic design history. Not only is this book a great conversational piece, but it truly is an inspirational source for any designer.The bold red and black cover attracts attention and the book has a large format filled with examples of these ideas in full color. The large size is great to flip through the pages and get lost in the fascinating world of text, images, and messages. The ideas range from the iconic to designs used every day. Below are a few examples of the ideas this book explores: - Idea 6 – Point Fingers explains the power of the We want you! with an index finger pointing at the viewer image from posters.- Idea 28 – Calligrams shows how the visual low increases effectiveness of a message.- Idea 36 – Corporate Identity gives an explanation of how this branding began in 1907 by Peter Behrens and its evolution throughout generations. - Idea 43 – Riddles and Rebuses demonstrates the effectiveness of this idea including the I heart NY message.- Idea 56 – Vibrating Color describes that color changes how the person views, reacts, and interprets a design.- Idea 72 – White Space reflects much more than a blank page and symbolizing a message in the pure simplicity of untouched area. Overall, I thought this book was a great way to generate ideas for projects and a way to compare what designs could work best. It really is a primer that should be on any designer’s shelf. 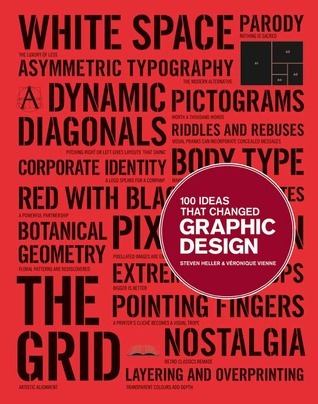 100 big ideas in graphic design, for example, paper cutouts, corporate identity and white space. Each idea has a double page spread, with imagery to illustrate the idea, and a page of text.A great reference book, easy to pick up and browse, or to read through from cover to cover. The ideas are in chronological order roughly, and you can see trends and ideas through the years. The text describes the idea, where and when it originated, and some examples of it in use, with big full colour full bleed images to help describe and explain.The ideas range from techniques, such as white space and stencil type through to notions such as sexual taboo busting and nostalgia. Some of the ideas are bigger and perhaps have had more of an impact than others, but all of the ideas mentioned and written about here are interesting and have some importance on the history and development of Graphic Design.I enjoyed this book, I was able to pick it up, and read through quite a few different ideas and then put it down again… and there is no doubt I’ll use this in the future for reference and research. Very good book, not entirely what I was expecting, but in a good way. The commentary and examples are very much provided through a professional designer's eye ... bordering on erudite but ultimately still accessible to non-professionals. The selection of "ideas" is very eclectic and tends to clump in a couple of preferred 20th century movements, but I was happy to surrender to the author's selections and be guided through the journey. The graphic examples were both beautiful and thought-provoking about the accompanying text. A minor quibble is that the captions are in extremely small font, bordering on illegible for my only-middle-aged eyes, and challenging if reading in evening low light. Other than that, well worth the time and expenditure. This is a very handy, clearly laid out reference book, that is also light enough to read through cover to cover. It would be an excellent place to start research for a project, as it also discusses main practitioners/examples of the ideas it's discussing. It isn't very detailed though, so it would only be a starting place.The main problem I have with this book is that often it would talk about a piece of design or art work and then not picture it, even though sometimes other pieces, which aren't discussed in the text, were pictured. This made it more difficult to see what the text was referring to if you weren't familiar with the pieces mentioned. nem olvastam el minden fejezetet (amik egyébként 1 oldalasak), mert túl kevés az infó, és a könyv szerkesztése is elég kaotikus. szóval ilyen nagyon alap infókat gyűjt össze (annyira, hogy a képanyag 90%-át is ismertem már), kicsit olyan, mint a kötelezők röviden. graphic design röviden, ha közöd nincs a témához, de szereted nézegetni a plakátokat és érdekel a művtöri. csak azért kap 3 csillagot, mert szép a layout-ja. A nice introduction into what the authors consider to be the most influential events in graphic design, whether it is a new technology (rub-on-design), a motif (ornamentation) or a social-related change(entrepreneurship). It is a easy read with relevant illustrations for each idea presented. It does not follow a chronological order and I feel it could have been better structured in order to let the reader retain the information within. This was a really fascinating read. I'd regrettably never done much digging into the history of graphic design, and this book introduces that topic in a really engaging format. I pretty much devoured it in a couple days. It's also a beautifully designed book in and of itself, very inspirational and I'm sure I'll be going back to it again and again. I wasn't enamored with all 100 of the concepts the authors highlight here, but there's plenty to satisfy anyone interested in the graphic representation of ideas. Some of the explanations also appealed to me more than others, but the visuals are always a delight. An easy read, I loved the insightful summaries with classic examples, wish I could post pics, but guess you'll have to pick this one up to see. All the great designers are found here, with all the many uses of graphic design. Great book for inspiration on graphic design. Not the best to read from front-to-back though. A single essay/article about each idea that changed graphic design - from rub-on lettering to white space. Awesome starting point of each topic for students and instructors alike. An interesting reference book, sometimes the example images don't perfectly embody the concept..but like... tons of inspiration and loads of good history. Like all books I read about art and design, I rarely read them. Instead I browse. This book is a good book to use as a reference. I took down some notes. Steven Heller Veronique Vienne - Steven Heller writes a monthly column on graphic design books for The New York Times Book Review and is co-chair of MFA Design at the School of Visual Arts. He has written more than 100 books on graphic design, illustration and political art, including Paul Rand, Merz to Emigre and Beyond: Avant Garde Magazine Design of the Twentieth Century, Design Literacy: Understanding Graphic Design Second Edition, Handwritten: Expressive Lettering in the Digital Age, Graphic Design History, Citizen Designer, Seymour Chwast: The Left Handed Designer, The Push Pin Graphic: Twenty Five Years of Design and Illustration, Stylepedia: A Guide to Graphic Design Mannerisms, Quirks, and Conceits, The Anatomy of Design: Uncovering the Influences and Inspirations in Modern Graphic Design. He edits VOICE: The AIGA Online Journal of Graphic Design, and writes for Baseline, Design Observer, Eye, Grafik, I.D Metropolis, Print, and Step. Steven is the recipient of the Art Directors Club Special Educators Award, the AIGA Medal for Lifetime Achievement, and the School of Visual Arts' Masters Series Award.